It’s because so many of you are football fans and just cannot WAIT for football season to start! Now, here’s the deal. I don’t really follow football (I know, I know – sorry) BUT… I do love the food. And I’ll also be bringing along some of these cheesy stuffed pretzels so that you’ll keep inviting me back over. These are easy to make, especially with the help of a little canned pizza dough, and my family LOVES them so they also make a great after school snack or movie watching treat as well. The recipe does include using a stout beer mixed with a little baking soda but never fear. The beer evaporates and cooks off so you get a fabulous, tangy pretzel taste but they are fine for grown-ups and kids alike. Although I’d personally rather not share with my kids because boys eat a LOT, you know. This recipe yields four pretzels but, since you’ll have plenty of the beer/baking soda mixture, I would suggest tripling the recipe. Believe me, party fans won’t care about the touchdown with these around and they won’t last long. So no matter which team you are (or are not) rooting for, I hope you’ll enjoy these as much as we do! And, just for Heather, “Roll Tide”!! 🙂 I’ll see you again next month and, until then, what is your favorite game day snack?? Spray large cookie sheet with cooking spray, or line with cooking parchment paper. Unroll the dough onto lightly floured work surface. Roll dough into 12x14-inch rectangle. Using a pizza cutter, cut dough lengthwise into 4 even strips. Along long edge of each dough strip, spread 2 tablespoons of the cheese. Stretch dough over filling; brush edges with water, and pinch to seal. Pick up ends and gently stretch each dough rope to 24 inches long. To make pretzel shape, form each rope into U shape. Twist ends twice. Pick ends up and fold over so they rest over bottom of U shape. Tuck one end under dough at bottom of U shape; other end lies over dough at bottom of U shape. In large microwavable bowl, microwave remaining beer uncovered on High for 1 minute 30 seconds or until hot. Slowly add baking soda; stir until dissolved. Dip each pretzel, 1 at a time, into the beer and soda mixture. Remove with large pancake turner or slotted spoon; place on a rack. Let stand at room temperature 5 minutes. Brush pretzels with egg mixture, and sprinkle with coarse salt. Carefully transfer to cookie sheet. Bake 11 to 15 minutes or until tops of pretzels are golden brown. 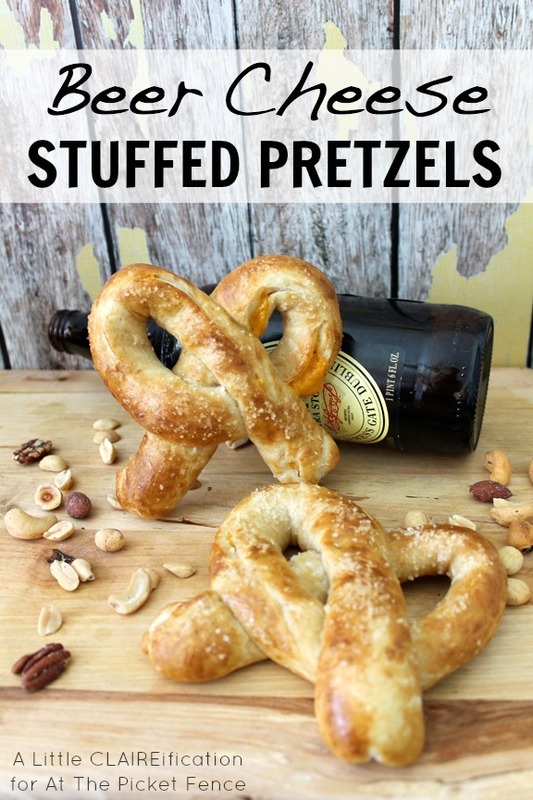 8 Comments on "Beer Cheese Stuffed Pretzels"
I adore recipes like this… using ready made food and making it fabulous! This just screams EAT ME WHILE WATCHING FOOTBALL! My family and friends will love love love this! Thanks so much for sharing!! I just added these ingredients to my shopping list – I’m so making these for Game Watch parties (and mostly myself, but nobody has to know that)! I am going to be a cheerleader for these pretzels, Claire! Dough stuffed with cheese? Count me in! Pinned to my Football Food board.